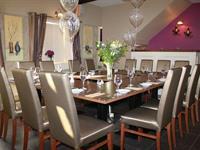 We are the ideal location to celebrate any event or gathering, whether it’s an intimate dinner for 2, to a large group. Christenings, Communions, Confirmations, Graduations, pre or post Wedding parties, Anniversaries, Birthdays, Reunions, Night’s Out and maybe ‘Just Because!...and anything in-between. We are honoured to be asked to cater for so many of your special occasions. We’re happy to open (*minimum numbers may apply) outside of regular hours to cater for your event/gathering. *E-mail or Call us on 062 56224 to discuss your individual requirements. 2 sections, maximum capacity of 30 per section. Renovated in recent times, to offer a unique atmosphere in comfortable surroundings. Our ground floor Dining Room is ideal for Private Gatherings, max capacity 20 seats. For groups of up to 16, tables can be configured in an inward facing square formation, perfect for conversation, very popular indeed and in high demand. Advance reservations strongly recommended- essential for weekends and special occasions. Most of our menu is Coeliac Friendly- all our Home-made soups and sauces are Gluten Free. Certain dishes can be adapted also. Please contact us in advance if you have particular Dietary needs, and we will do our very best to accommodate you. For the perfect Gift, both to give and receive- in any denomination of your choice. 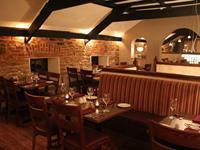 A Ballinacourty House Restaurant Gift Voucher. Call and Collect anytime- Pay on Arrival. Order by phone- call us on 062 56224 and pay by Credit/Debit Card over the phone, we offer free postage to any Irish address, either to yourself- so you can give the gift in person, or we can post it directly to your intended recipient, with a personalised message if required. Hassle Free. E-mail enquiries welcome also. It may be possible to arrange local drop-off also, enquire for more details. For Voucher purchases outside of Opening Hours- please call to the house around the bend to the left after the restaurant entrance- black gates and purple front door. *Parking is Limited- Groups, please car share where you can. If the main car park is full when you arrive- don’t worry. Ask your driver (nicely!) to drop you at the entrance- especially beneficial if you or a member of your group is in heels! Take the next left- parking is available on this side (B&B and Camping) Pedestrian access back to the restaurant, under the open Archway, walk across the courtyard, and into Restaurant Archway, from this access point- Main Dining room to the right, Ground floor dining to the left. *Please do not park on the roadway or at the edge of Forest.